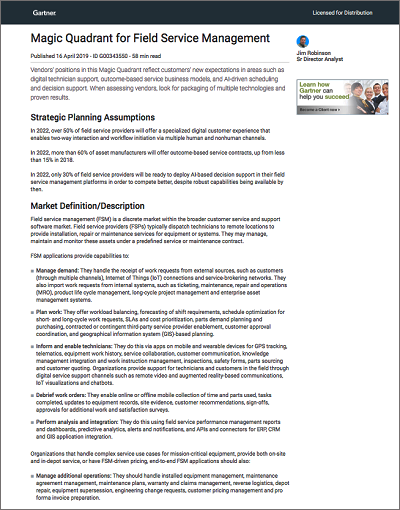 Vision in the Gartner 2019 Magic Quadrant for Field Service Management. for equipment manufacturers and service providers. In addition, ServiceMax provides service execution solutions for operators in asset-intensive industries. The ServiceMax mobile app has the service execution functionality you need to improve technician productivity with any device. When a technician is needed on site, you need to ensure that your field service execution teams are utilised efficiently. Empower your technicians to review, debrief, and close work orders with customer signatures, while ensuring customers' SLAs are met, every time. Installed Base Management helps technicians maintain up-to-date asset information, and provide extraordinary service. More than 400 companies across the globe have turned to ServiceMax to help them keep the world running. Your single source of truth for as-maintained customer equipment to help you instantly know what is actually on site, even when there is no Internet connectivity. You know exactly where, when and how to service products to deliver the best service, so customers stay happy and you stay profitable. Is your company ready for a new era of service? 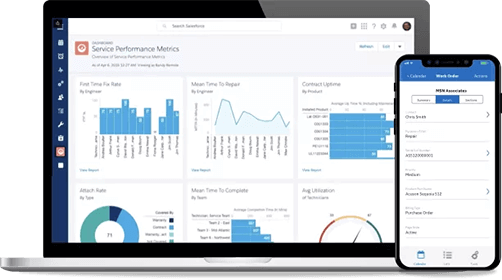 Then make sure to join us for an upcoming product demo webinar to see ServiceMax in action!